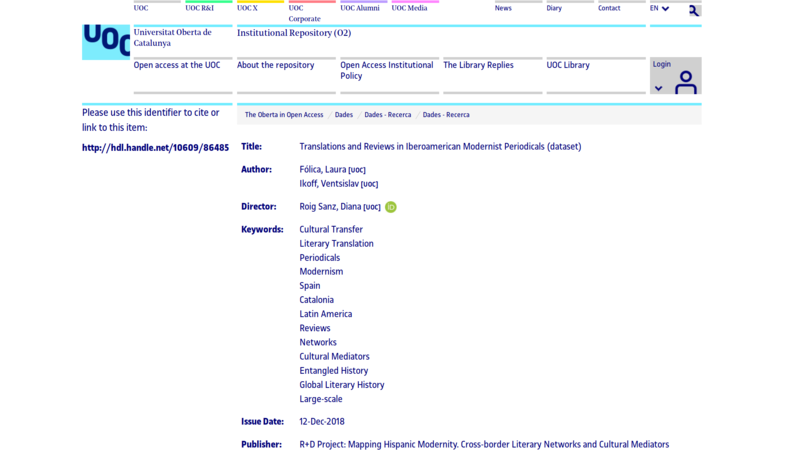 The MapModern project at the Universitat Oberta de Catalunya (UOC) which focuses on cross-border literary networks and cultural mediators in the hispanic world between 1908 and 1939, has recently published a dataset on translations and reviews in hispanic modernist journals. This dataset has been created in their nodegoat database and currently includes all translations or reviews from La Revista (Barcelona) from 1915 to 1936; the second period of Proa (Buenos Aires) from 1924 to 1926, and Sur (Buenos Aires) from 1931 to 1939. More data from Iberoamerican journals will be added in the future. Laura Fólica and Ventsislav Ikoff have collected the data, Diana Roig Sanz is the PI of this project. With the help of the staff of the UOC library, the dataset has been made Dublin Core compliant. The dataset can be downloaded from the data repository of the UOC: http://hdl.handle.net/10609/86485, or from the EUDAT Collaborative Data Infrastructure which has assigned the dataset with a DOI: 10.23728/b2share.eb5c468d3dc3401c8b2fb4605d868a00. The suggested citation is: Translations and Reviews in Iberoamerican Modernist Periodicals (dataset) by Fólica, Laura; Ikoff, Ventsislav; Roig Sanz, Diana; Dec 12, 2018. This publication is a great example of how scholarly data can be made available and we want to use this opportunity to underline its importance. Since we started the development of nodegoat, we have always encouraged scholars to create, share, and reuse datasets. Due to the lack of academic credit that is awarded to data publications, most scholars are not supported to take the time to properly describe, disambiguate, and clean their data for publication. During the DHLU 2013 conference (titled "Digital Humanities in Luxembourg with a Special Focus on Reading Historical Sources in the Digital Age"), we presented our ideas regarding an infrastructure for the publication and reuse of data: "Towards an Object-Oriented Referencing System: Defining Multiple Forms of Asynchronous Collaboration and Authorship" (download PDF). Even though we have seen the rise of numerous initiatives that should make data sharing easier (like Zenodo and EUDAT), scholars in the humanities rarely publish datasets, let alone reuse them. Let us continue to work to make publishing datasets a common practice. Diana Roig-Sanz has recently been awarded with an ERC starting grant, so her project will be able to continue to publish high quality datasets.